. . . to shop apparently! At least that's what my email told me this morning. But I will admit that after the food is cooked and eaten and cleaned up, I do like to do a little shopping. So if you are looking to shop for gifts or add to your stash or stock up on supplies, here are a few opportunities to check out. But first a little shameless self-promotion. 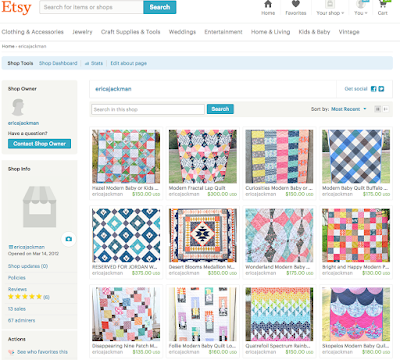 All quilts in my shop are 15% off through Monday. Just use coupon code HANDMADEHOLIDAY. FabricCadabra has 20% all orders Friday - Monday using coupon code BLACKFRIDAY20. 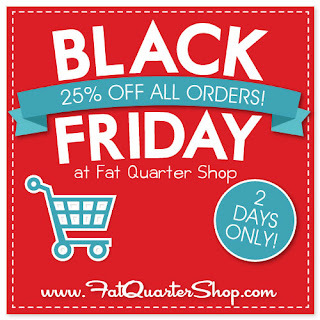 The Fat Quarter Shop is offering 25% off all orders through Saturday at Midnight, no code required. Lark Cottons has 25% off sitewide through December 2nd using code TURKEY25. Fabricworm has 15% off sitewide, plus a clearance section with 30-60% with coupon code HOLIDAY until Monday at 5pm PST. Suggestion for new puppy..entry for giveaway. When we got ours we tied a string of bells on the back door knob. Every time we took him out we said out and rang the bells. It took a little while because he doesn't like strange noises. However, now when I'm back in the sewing room and hear the bells ring, I know he needs to go out. Works like charm. Very nice. I am freelance writer of admission essay writing service which provide services to the students who are struggling in making their admission essay as the best one. The admission essay has a great impact on the admission process. So everyone needs best admission essay.